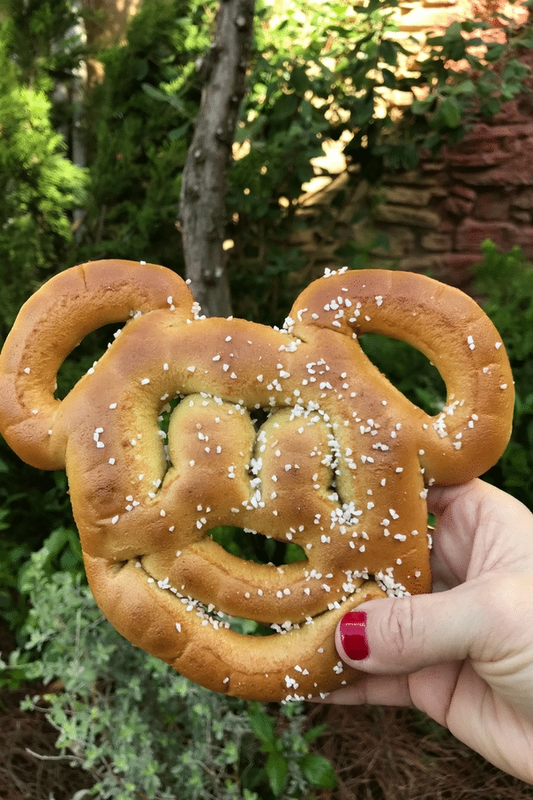 Looking for the Best Walt Disney World Treats? Look no further! 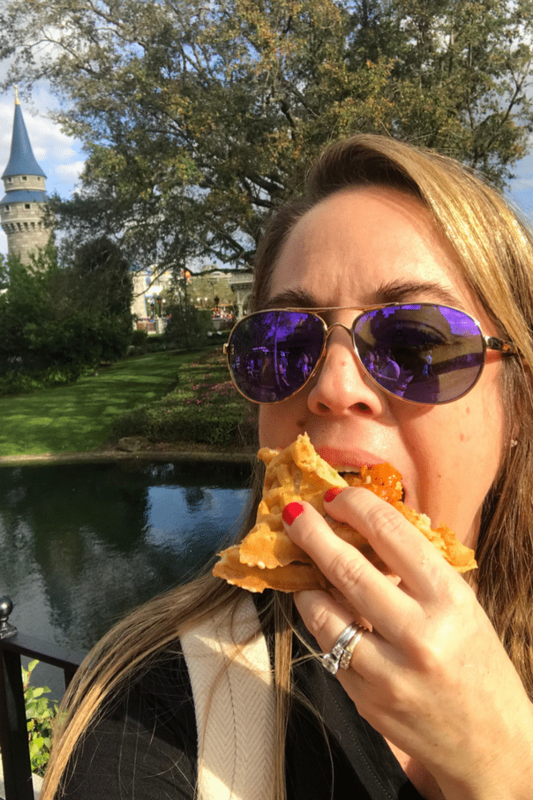 I recently had an amazing adventure at Walt Disney World and today I’m sharing tons of amazing food available at the parks! I was invited to attend the Disney Social Media Moms Celebration Land and Sea event several months ago. Last week, it finally happened. My husband, our 15-year-old son and I had the best time ever. I mean, how do you not? After all, this is Disney we are talking about. The first portion of our trip was at Walt Disney World. Not only did I learn amazing things to help me grow as a blogger and a person, but I was also able to make magical Disney memories at the parks with my family. Disclaimer: I recently attended the Disney Social Media Moms Celebration at Walt Disney World and Disney Cruise Line. I paid my own way to attend the celebration. All opinions and text are my own. Needless to say, we ate all the food. No, we literally ate until we couldn’t eat anymore. 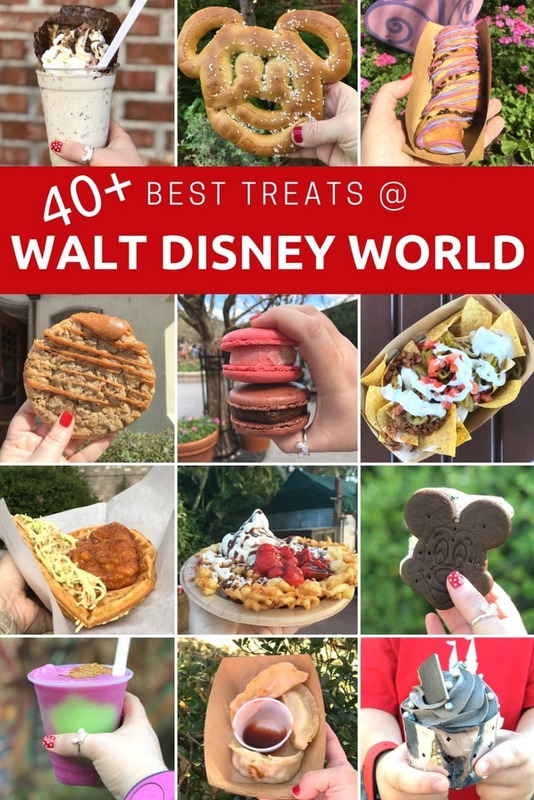 I’ve teamed up with two of my blogging friends to bring you more than 40 of the best Walt Disney World Treats. First up, some serious savory treats you do not want to miss. Did you know there are lots of yummy treats for only about $5? Here are only four of them. I discovered the first three great finds at Epcot. First up are these delicious curry chicken pockets. With just enough curry flavor, they are sure to be a favorite of both adults and kids. The chicken is both flavorful and tender, plus, the cute little pockets are perfect for eating with your hands. You can find these at the China Tea Cart in China for only $4.50. Next are the pot stickers. These pan-fried pockets of goodness are one of my favorites. My only disappointment is that they were so good, I wanted more of them. 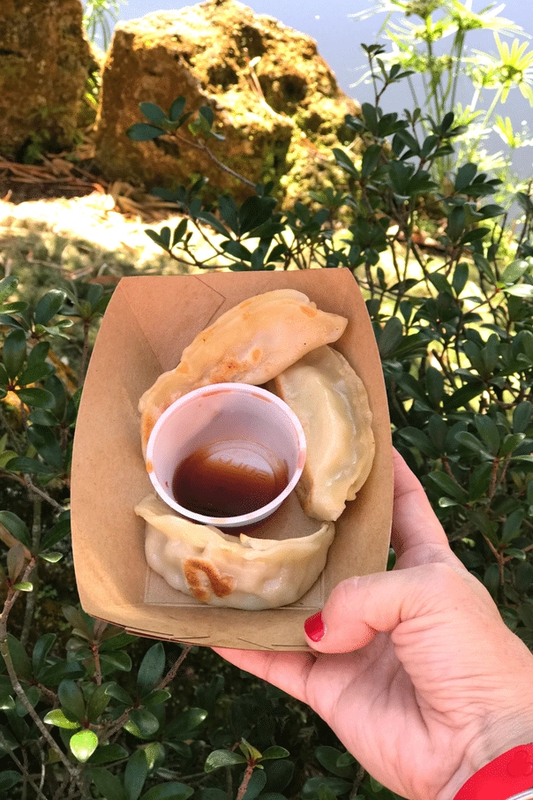 We scored these at Lotus Blossom in China for just $5.25, They are served with both a sweet sauce and soy sauce. This is for all you sushi lovers out there. 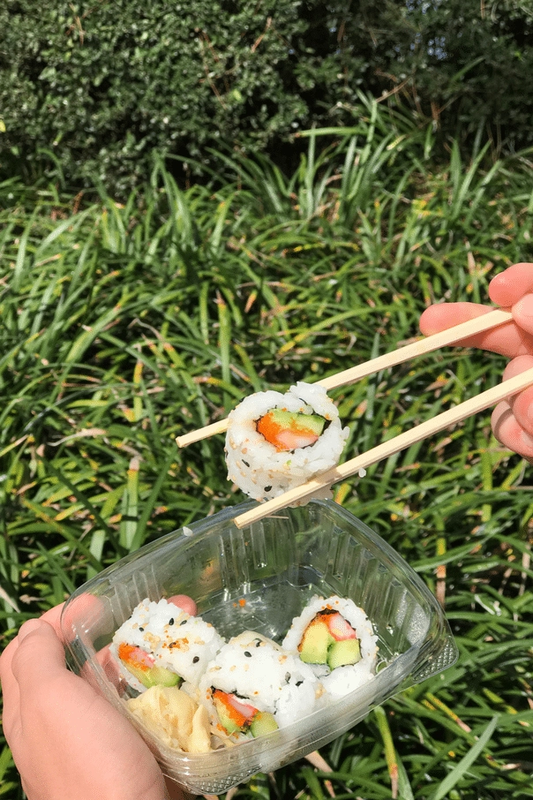 I didn’t even know you could get sushi at Epcot! This California Roll is at the Kabuki Cafe in Japan and comes with fresh ginger and soy sauce. We loved using chopsticks for a more authentic experience! 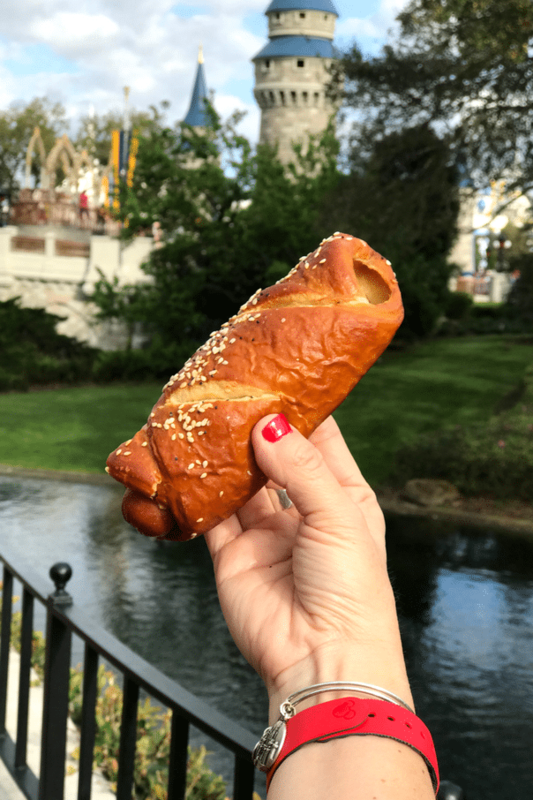 Finally, the last treat for about $5 is the famous Mickey Pretzel. It’s a classic, and for $5.69 it’s a must. We got this one at Trek Snacks in Animal Kingdom, but they’re available all over the parks, so you shouldn’t have trouble finding one. I love eating mine with mustard, how about you? For more treats under $5, be sure to check out my post on 5 Disney Treats Under Five Dollars! First up is the All-Beef Pretzel Dog. It’s perfectly sized to fill you up, but not much, so you still have room for dessert. At just $9.49, it makes a great meal on the go. Because when you have rides to go on, you don’t want a sit-down restaurant. Get yours at Sleepy Hollow Refreshments in Magic Kingdom near Cinderella’s Castle on the way to Liberty Square. Another favorite of mine is the Sweet and Spicy Chicken Waffle Sandwich. This one is great for sharing unless you’re super hungry. The full-sized waffle is topped with a battered and fried spicy chicken breast and coleslaw. Definitely for the big eaters in your group and a steal at $8.99. I found mine at Sleepy Hollow Refreshments. And, yes, that’s me shoving a bite into my mouth. Because, hello, it was amazing. 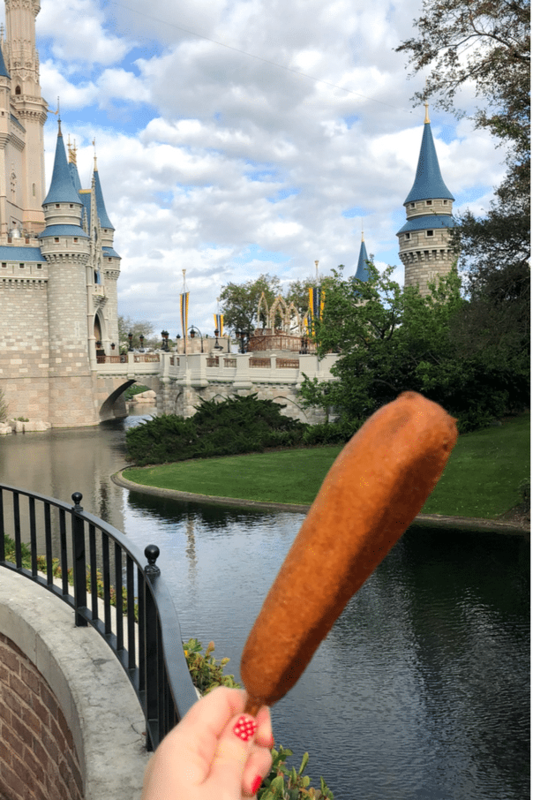 Next up is the Hand-dipped Corn Dog. This all-beef bundle is perfect for the kids. And at $8.49, mom and dad will love the price. You’ll find this one at Sleepy hollow Refreshments as well. Do you love Mexican food like I do? Then taking a trip to Mexico (in Epcot, of course) is worth the trip! This freshly made guacamole is an avocado lovers dream come true. Pure mashed avocado topped with diced tomato and BAM! Guacamole for everyone. 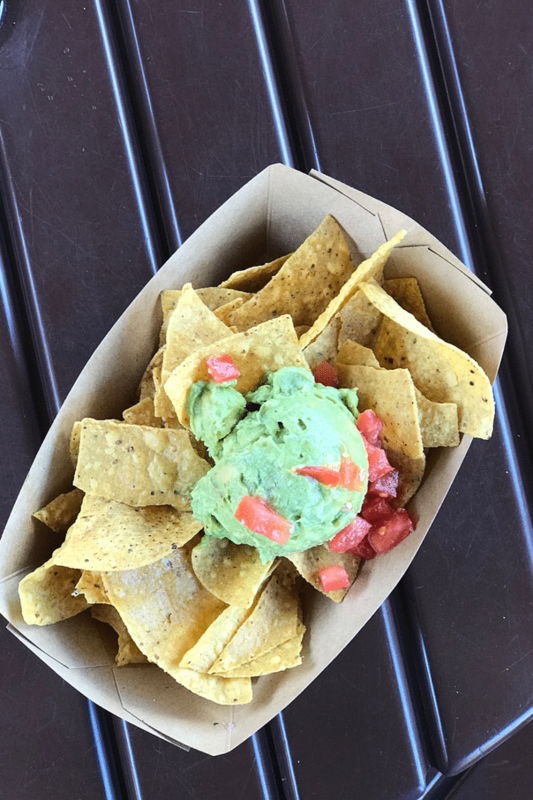 Don’t pass up the Guacamole and chips for considerably under $10 at Epcot’s La Cantina. Since you’ll be at La Cantina anyway, you don’t want to pass up the Nachos, either. 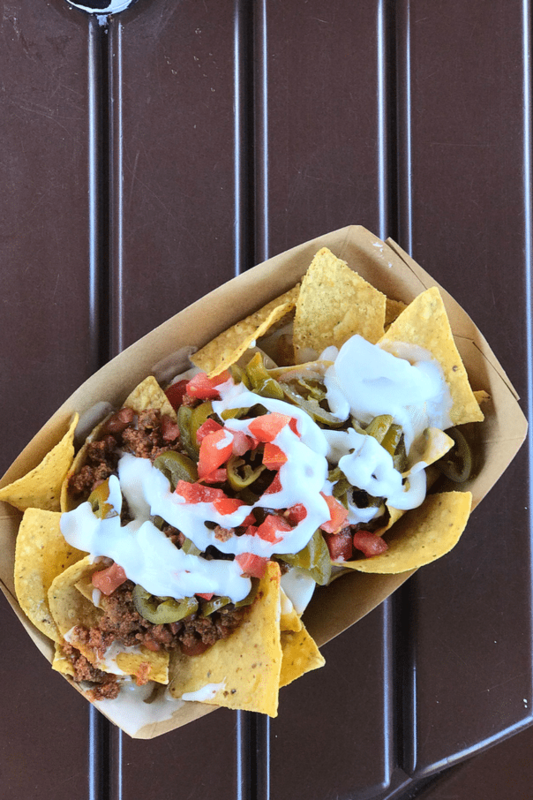 These crowd-pleasing chips are topped with ground beef, nacho cheese, tomatoes, beans, jalapeños and sour cream. They’re perfect for sharing and reasonably priced at $11.25. Are you interested in somewhat lighter fare? Then the Fairfax Salad is for you. 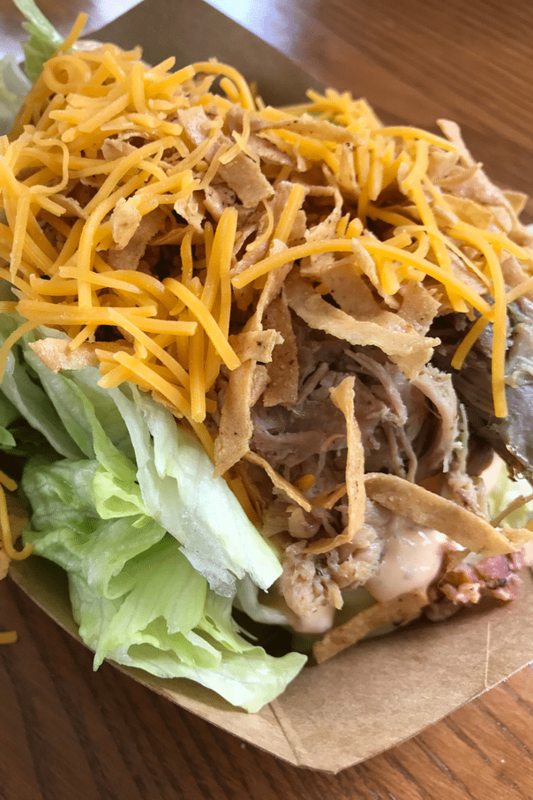 This refreshing wedge salad is topped with carnitas (pork), tortilla strips, shredded cheese and jalapeño ranch dressing. Loaded with flavor and less than $10, it’s a must! Get yours at Disney’s Hollywood Studios’ Fairfax Fare. Also, if it’s a classic I’m looking for, popcorn is a go-to. Available at Epcot’s Fife and Drum Tavern, (along with the hugest turkey legs ever! ), I love it as a quick snack. 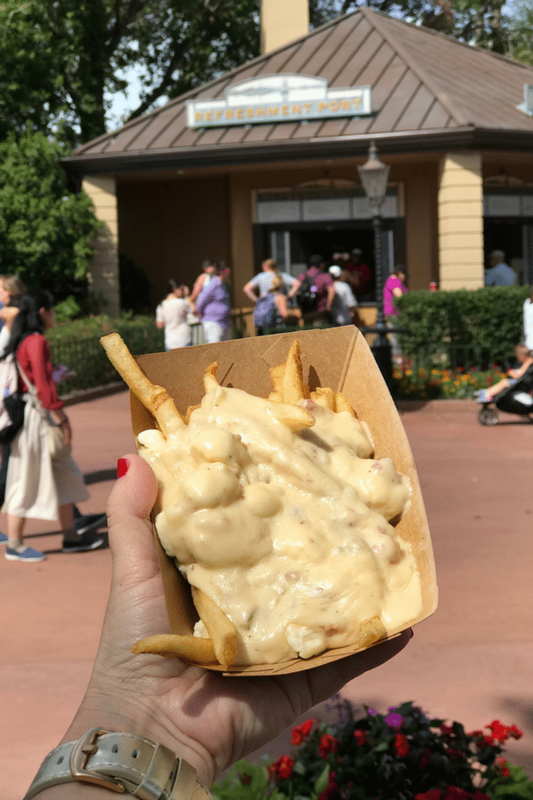 Last, but certainly not least, is the poutine fries at Epcot’s Refreshment Port just as you’re leaving Canada. I just couldn’t resist these french fries that were topped with white cheddar cheese curds and an amazing Canadian cheddar cheese soup that has bits of ham in it. 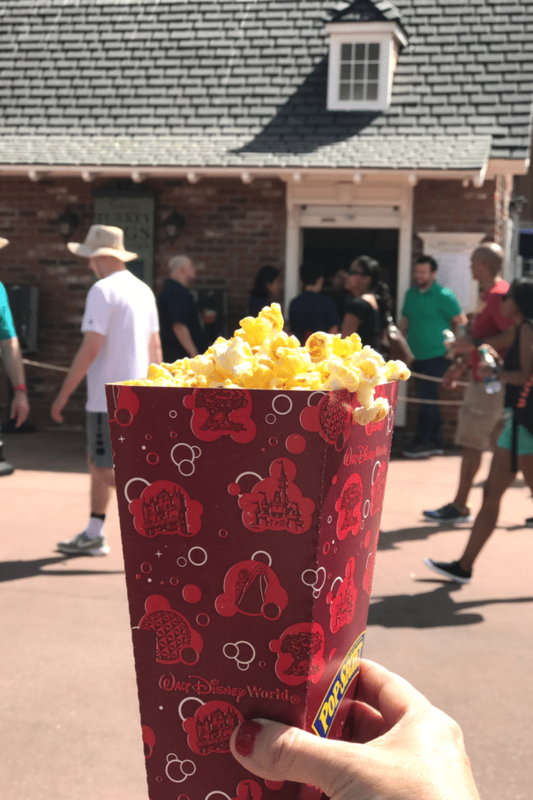 Are you ready to move on to even more Best Walt Disney World Treats? Book a Southern California Disney vacation and use code disorganized10 for an additional $10 off! Every dollar helps! Yes! These are all fabulous. I seriously could eat at Sleepy Hollow for every meal of the day! 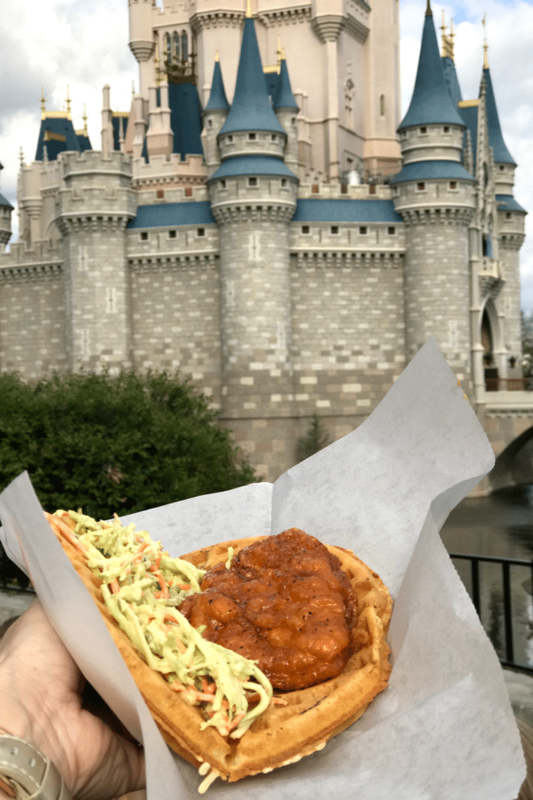 Oh my gosh, the spicy chicken waffle sandwich was the absolute BEST! Love this list of snacks! 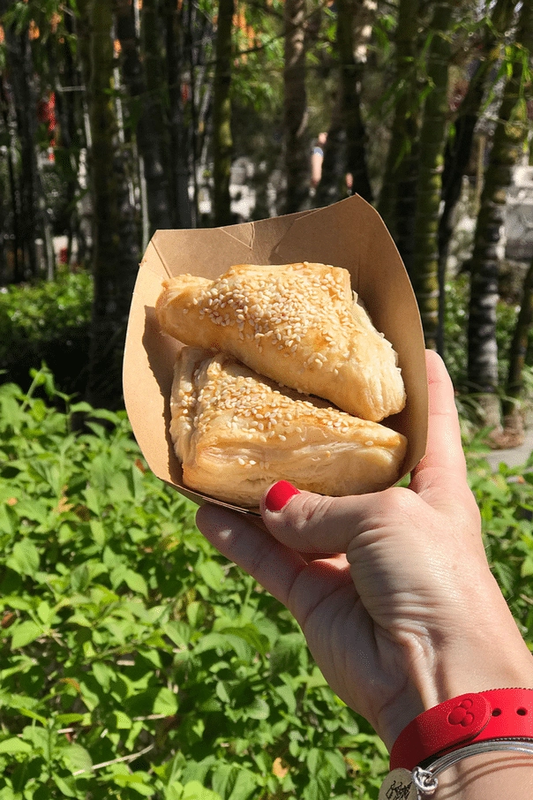 Epcot is always my favorite place to find delicious snacks from all over. I’m always partial to the gelato, it’s so good! Oh man, Disney food is the best! I'm totally itching to go back now. Isn't it, though? I loved everything we ate! The food at Disney is the best! I'm a big Dole Whip fan!